Based on the book Carandiru Station by Drauzio Varella, this Brazilian film chronicles life in the largest prison in Latin America. Varella wrote the best-seller about his own experiences over 12 years serving as a physician for the infamous Sao Paulo penitentiary. 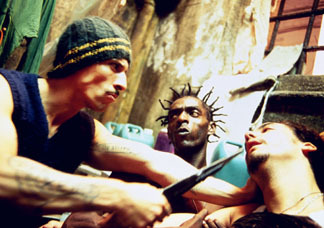 The Doctor (Luiz Carlos Vasconcelos) gradually earns the respect and confidences of the inmates as he struggles to treat the numerous health problems that arise from the jail's appalling conditions with the most rudimentary equipment and educate the prison population about the burgeoning AIDS epidemic. The film shows the intricate social and power structure of the inmates and follows their daily routine of conflict and compromise, falling in love and falling apart. This narrative is inter-cut with flashbacks of the stories from the outside that led these people to incarceration. The film culminates in portraying the events of October 2, 1992  known as the Carandiru Massacre  when a prison riot ended in the unmitigated slaughter of over 100 inmates by an out-of-control riot squad.